It's here!!! Finally... after 5 years of trying to figure out what I wanted, stressing about paint, backsplashes, cabinet color and who knows what else, I finally figured out what I wanted. It wasn't an easy journey. There was blood, sweat and lots and lots of tears (mainly over the kitchen island). There were 4 backsplashes and I painted the cabinets 4 times. Yep, it was a huge undertaking. For those who have been following for a bit, you probably have the before photos etched pretty firmly in your brain. For those who are new, let me share what the kitchen looked like when we bought it. 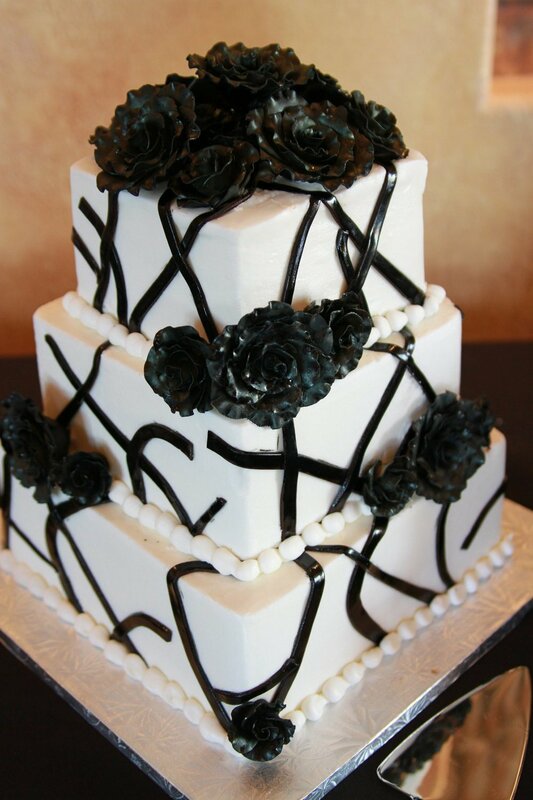 My black and white wedding. My hubs wore all black and so did my girls. I have been asked by quite a few people about my ring (those of you who pick up on the little things in tutorials). It is a true black diamond (not lab created) and I have loved it since the moment I saw it. But back to the kitchen. The first thing I did was paint all of the cabinets black. I painted my kitchen cabinets black in my first home (in 2001) and thought it would look good here too. I was wrong. It was way too dark. If you notice, the backsplash back then was glass. I tried to get into the glass tile trend, but it just wasn't for me. The next step was black and white tuxedo cabinets. I even added hardware this go around. It lasted a month. The one thing that did stay, though, was the marble backsplash. It was the fourth I had. The glass tiles above were the first. Then I tried stainless tiles, then back to glass (I was really trying to go with the trend) and then I ended on marble. There is something important I want to note here - the reason the I ended up changing backsplashes so many times is because I was trying to save money. I really wanted the marble backsplash but didn't want to spend $20 sq/foot. The irony - I spent a lot more than that swapping out the backsplash and then still spent the $20 sq/foot. The good thing about wasting all of that money was it taught me a very important lesson - if I don't love it, I don't buy it. No settling. That's probably why it took me 5 years to figure out what I wanted for countertops. But I digress. At some point during the black and white stage, I built my custom range hood and added a Broan Range Hood insert (affiliate link). Check out that tutorial here. Then I decided to go all white. It stayed that way for a couple of years because I didn't hate it. Those counters, though. What in the world would I do with those counters. I had actually called a few granite companies to quote various granites but nothing ever really fit. I actually had two or three companies tell me they wouldn't remove the counters because it was "so rare" and "damaging it would be a shame." At one point, I talked to one of my besties about selling it to her. The granite folks told us we would never get it out without breaking it so we never really did anything. Then, this December, I finally decided what I wanted for the counters. Wood! But not the wood you typically see in kitchens - I wanted something thick and something different. I called my friend and asked her if she wanted the counters. She has always loved them so she was my first thought. I called her and of course she wanted them but I had to do some convincing to talk her into letting me give them to her gratis. My one stipulation: They had to come get them. So I went about taking the granite out. And wouldn't you know - I didn't break any of it. Take that granite guys! Part of taking out the granite involved destruction - mainly of the island. Actually, that destruction was because we wanted to get rid of the raised bar. It encroached into the walking space between the living room and kitchen a bit more than we wanted. Plus, I don't like raised bars. It's just one of those things I'd rather do without (besides, all it ever did was collect junk). Once the granite was all out I started working on remodeling the island. I opted to do the same paneling I have in the foyer to tie it all together. Then it was time for the counters. I did the back wall and the area around the stove first. I stained them Black Walnut and loved it! I started working on the island. I glued the long strips together and stained it. It was boring. I wanted the island to be different but I wasn't sure what to do. While taking a shower one day, I had an idea (random, right?). Once I got dressed I went into the kitchen and tested it out. Yep, Herringbone. I mean, why not? It was different and I love different! I went for it and then decided to stain it the same black walnut. It was ok but it wan't really doing anything for me. A couple of days later I painted the island area. While I loved the color, I hated the overall vibe of the island. The dark counters and the blue paneling just weren't working. After thinking on it for a couple of weeks (yes, it took me a couple of weeks), I decided to white wash. Well white wash-ish. Truth be told, the hubs and I call this "I give up" gray wash. I literally got to the color I wanted by giving up on it. I couldn't get the blend right so I poured mineral spirits all over to start over and somehow, some way, I got it the way I wanted. Then it sat for a bit. I was so frustrated by trying to get the color right that it wore me out. I decided to step away and work on a few other things. I started with getting rid of that terrible ceiling fan and making my own light fixture. Then I moved on to making my amazing Bronze Range Hood using Modern Masters Reactive Metallic Bronze Paint (affiliate link). Next I worked on adding trim to the cabinets and drawers and legs to the cabinets. I gave the pantry a little black and white update of it's own. And then I built a slide out drawer for under my sink. After all of that, I didn't do much. I was tired. Worn out. Exhausted. I'm telling you, that kitchen island almost broke me. After walking away for a week, I went back and began adding the edging to the island and guess what happened? The sink piece broke! I kid you not. Sigh. Literally, I just sighed typing that. It still wears me out. The hubs and I ended up redoing the sink area. We knocked it out in a day and I was actually able to get the stain pretty close to the other side. Why did it break? Because I was so worn out when I did it, I rushed through. Lesson learned. Note: You are probably wondering how just the sink section broke. We decided to make the sink it's own piece as a precaution. You know, just in case it warps or something. So yeah, had to redo that section and then took another week off. The only thing I had left to do was add trim to the window (to match those in the dining and living areas) and make a new shade (the old one was too short once I added the trim). I knocked those out and that, my friends, was that. So, for those of you who didn't skip down already, here it is. Five years of not knowing what I really wanted finally came to a head and this bad boy is done. I'm so happy to share it with all of you! So there you have it. What do you think? I truly am proud of this kitchen for one very big reason - it is completely DIY'd (except for moving 2 plugs hardwired into the floor. I let our electrician do that). I have so much pride in knowing that we did this ourselves and I keep pinching myself that the thing that I have stressed, planned and cried over is now finished. Finally. Total cost: $7540 (less appliances, the cost was $3040). While $7500 isn't exactly cheap, I think considering what we did, it is amazing. I saved almost $2000 doing the range hood myself, $5000 by doing the counters myself and around $10,000 painting the cabinets. I would say with all the other little things, I saved around $20,000!